Improving quality and achieving better outcomes continues to be a major focus in the areas of public health, healthcare, social service, education, and related fields. In all of those fields, there is a need to not only develop strategies to implement improvements but also to ensure that the improvements are sustained over time. While both funders and organizations have indicated that sustainability is critical, there remains a need for clear definitions, models, and assistance to guide sustainability efforts. 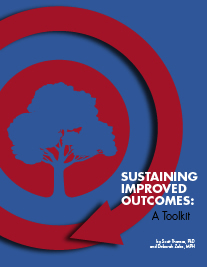 This website provides guidance on how to sustain improved outcomes. The website provides an introduction to sustainability, a description of 12 factors that contribute to sustainability, and assessment and planning tools for both organizations and funders. All of the information has been compiled in a toolkit that you can download and use for free. The toolkit authors, Scott Thomas, PhD, and Deborah Zahn, MPH, have also conducted trainings and provided technical assistance to many organizations across the country. This overview provides a description of what sustaining improved outcomes means and how it differs from program and organizational sustainability. This section provides easy access to tools from the toolkit that are designed for organizations to use. This section provides easy access to tools from the toolkit that are designed for funders to use. This section describes the types of trainings that the toolkit authors offer on sustaining improved outcomes. This section describes the types of technical assistance that the toolkit authors offer on sustaining improved outcomes. This section provides a list of resources on sustainability from journals, foundations, and government agencies. The toolkit was developed with leadership and funding from the Asian Pacific Islander American Health Forum, the Community Health Foundation of Western and Central New York, and the New York State Health Foundation.